Home entertainment family Girls Guys Interesting news recent relationship slider video Viral Section vs This Abusive Husband Brutally Beats His Wife in the Street; Then Afterwards He Received The Taste Of Bad Karma…Lesson Learned!! 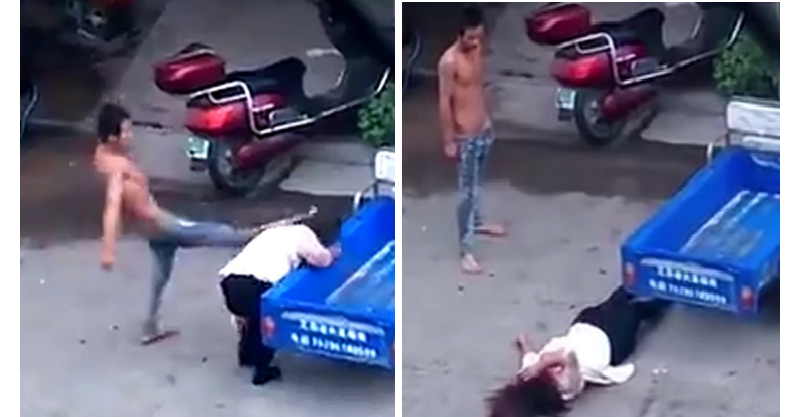 This Abusive Husband Brutally Beats His Wife in the Street; Then Afterwards He Received The Taste Of Bad Karma…Lesson Learned!! Domestic violence is getting at its peak; more and more cases of it have been constantly reported. The series of these cases is very alarming to the society that affects the countries itself. In China alone the percentage of domestic violence reach of the highest detailed cases, almost 60% of domestic violence is from China but many percentages are unreported. The cases of Domestic Violence are considered as a private matter that is why police officers are rarely involved in the situation. A viral video of a man that was taken in the East Shanghai, China had the attention of the netizens, an abusive husband was caught beating up his wife. The neighbor was able to film this man as he was beating his wife on the streets. Instead of calling the cops because of the incident, the neighbors continued filming the scenario. As seen on the footage, the man gave the woman, who was his wife several kicks and punches until she falls to the ground. She was badly hurt that she could not even stand on her feet. This abusive scenario caught the eyes of all the neighbors. Then the husband was seen antagonizing the crowd of bystanders who were watching him as he was beating his wife. The crowd got furious and gave the man a taste of his own medicine.